As there was Saturday, there is another $1 million guaranteed Jackpot pool in Sunday's 20 cent Rainbow Pick Six at Santa Anita. On opening day, Friday, one lucky ticket came within one length of hitting a $250,000 Jackpot in the ninth and final race, so the prospect of a life-changing score is very much a reality heading into Sunday's nine-race matinee, which will get underway at 12:30 p.m.
Sunday's Rainbow Six will begin with race four, which has an approximate post time of 2:05 p.m. PT. The Grade I, $300,000 Zenyatta Stakes has been carded as Sunday's fifth, and with Bob Baffert's Abel Tasman installed as the heavy 2-5 morning line favorite, a good many punters may opt to approach the Sunday “six” as a Pick 5 in order to spread deeper in all other races. The 20 cent Rainbow Pick Six, which has proven to be a tremendous success at Gulfstream Park, was initiated with the onset of Santa Anita's 22-day Autumn Meet yesterday and has proven very successful through two days. Today's total Rainbow Pick Six handle was $251,385, which resulted in 12 winning tickets worth $11,189. Yesterday's Rainbow handle of $82,392 resulted in six winning tickets, each worth $7,336. 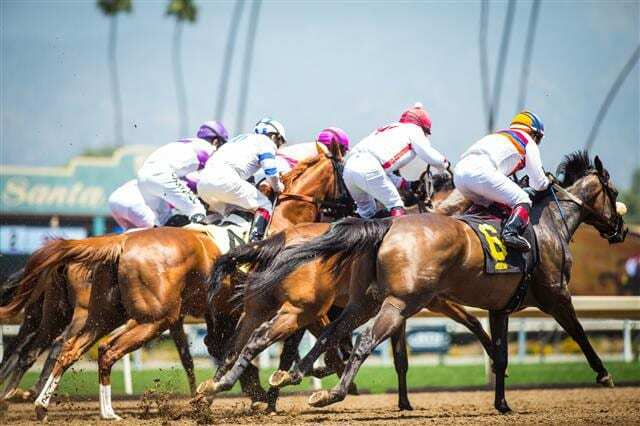 This entry was posted in Horseplayers and tagged guaranteed pool, Handicapping, horseplayers, jackpot, jackpot wager, pick six, rainbow pick six, santa anita, santa anita park, Wagering, zenyatta by Mike Willman/Santa Anita. Bookmark the permalink.